Nov. 26, 2018 – Atlantic Canada’s logging industry has always run lean, but, while operating costs are steady, rates are stagnant and profits seem to be slipping. But the bigger question is, where are the young people? In 2016, CFI’s Contractor Survey found that Atlantic Canada’s contractors are smaller and older than the rest of Canada, but their profits were more stable. Our 2018 survey finds similar results, but the profit picture is worsening. That may explain why more of those contractors are looking to leave the industry in 10 years or less. But with minimal succession planning happening, the industry may look radically different over the next decade. 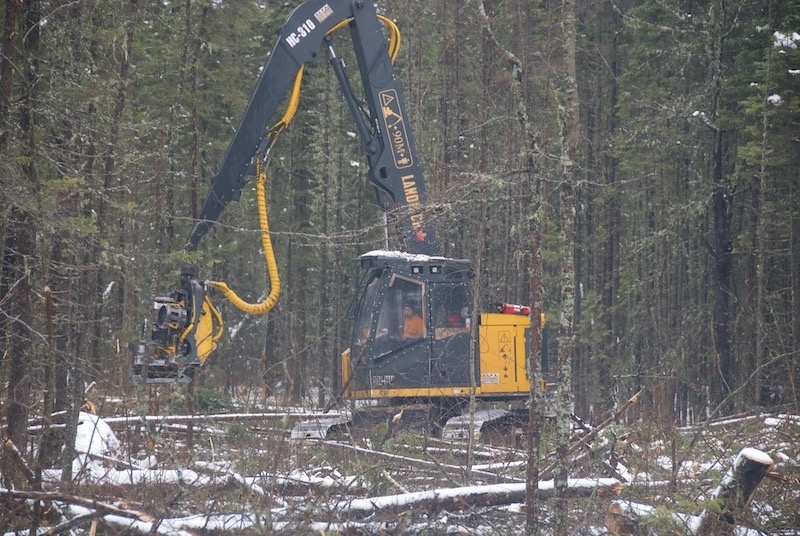 Stagnant logging rates are a concern across the country, but Atlantic Canada appears to once again be among the hardest places to negotiate better rates, with 17 per cent of contractors reporting lower rates today than in 2013, and just 28 per cent seeing a rate increase. This is, however, a slight improvement from the even split of 23 per cent that reported a rate decrease and increase in our 2016 Contractor Survey. Still, it places Atlantic Canada in the lowest spot for rate negotiations in Canada, with the national average of 44 per cent seeing a rate increase over the past five years. In Ontario and the B.C. Interior that number jumps to 67 and 63 per cent respectively. While rates aren’t the full picture when it comes to profits, in Atlantic Canada there may be a correlation over the past couple of years. More than a third of contractors say they made no profit last year, which is higher than the national average of 28 per cent, and twice the number of Atlantic loggers that reported this result in our 2016 survey. A full third peg their 2017 profit at between 1 and 5 per cent. Just 11 per cent made between 6 and 10 per cent and a meagre 6 per cent achieved 11 per cent or higher profit margin. It’s worth noting that these contractors work with below average harvest volumes and revenue; however, the concern is the slide in profit margins compared to our 2016 survey results. One relief for Atlantic loggers seems to be relatively steady operating costs. Contractors in Atlantic Canada are among the least likely to report significantly higher machinery purchase, parts and service, and fuel costs. Just 22 per cent have seen fuel costs increase significantly, compared to more than 80 per cent on the B.C. Coast and in Ontario. With the majority of Atlantic contractors reporting labour costs as having increased only slightly, it’s not surprising they pay the lowest operator wages in Canada. The average operator there earns $20 per hour, $9 less than the national average. Quebec is the next lowest at $25/hour. Breaking the numbers down in Atlantic Canada, more than half of contractors pay between $16 and $20 per hour, with another 37 per cent offering $21-$25/hour. None pay more than $26. The wage breakdown has changed over the past two years, with more contractors paying between $21 and $25. Atlantic operators are also the least likely to receive benefits on the job, with just over a third of contractors offering some form of benefits to employees. This is a stark contrast to western provinces or even Ontario where at least 79 per cent of loggers offer benefits. Those that do in Atlantic Canada are most likely to offer medical and dental or life insurance plans. Loggers in Atlantic Canada have the distinction of running the smallest operations in Canada. On average they harvest 82,000 cubic metres a year, with less than 5 per cent of companies in the 250,000 m3 plus a year range. The national average is 189,000 m3. In neighbouring Quebec the average is 110,000 m3. Yet, when comparing their annual revenue, Atlantic Canada is not far behind Quebec in spite of the significant volume difference: $2 million in Atlantic Canada versus $2.2 million in Quebec. Both numbers are far below the estimated national average at $4.5 million. The B.C. Interior leads the pack with an average of $7 million and Alberta is a close second at $6.9 million. About half of Atlantic loggers run between one and three machines in their operations, while the other half run between four and 20. A small percentage (fewer than 9%), run large operations of between 51 and 100 machines. That same percentage employs more than 50 people, while the average employs around nine. Close to 18 per cent have no employees. The companies may be small, but they enjoy some of the best market competition for their logs and other wood products. Survey results show 42 per cent of contractors in Nova Scotia and New Brunswick have at least five customers. Another 36 per cent supply to three our four customers, and 19 per cent have one or two buyers. Smaller companies and lower revenues mean a lower barrier to entry in Atlantic Canada, which ideally translates to more young people starting out in the industry. Unfortunately, this doesn’t seem to be the case in Atlantic Canada where contractors are among the oldest in the country. While the estimated average age of contractors across Canada is 49 years old, in Atlantic Canada the average is 52. Broken down, 43 per cent of the pool is over 56 and just 12 per cent are under 35. Those statistics are only worse in Ontario and B.C. where the average age is 54. By comparison, in neighbouring Quebec the estimated average age is just 40, and 31 per cent are under 35. It begs the question, what are they doing different there to attract the next generation? The issue of who will take over in Atlantic Canada becomes even more pressing when we look at expected retirement timelines in the region. More than two thirds (69%) of Atlantic loggers plan to be out of the industry in 10 years or less, and for 39 per cent it’s five years or less. This is a significant change from what we reported in 2016, when just 36 per cent expected to leave the industry in 10 years or less. With so many looking to leave in the next decade, it’s concerning that when asked about their succession plans, more than half (58%) have no real plan for the business, divided between those who admit to no plan and those who will auction and close. Twenty-eight per cent expect their children to assume control, while the rest have managers interested in taking over or expect to sell to another contractor. When asked about future challenges, a few things stand out for Atlantic contractors. For one, they are more likely than their Canadian counterparts to see access to markets as an important challenge to address. Over 80 per cent rated this as “very important” compared to the national average of just 44 per cent. Access to fibre is also a major concern, specifically in New Brunswick where 89 per cent of contractors rated it as a very important challenge to address. Interestingly, Atlantic Canada contractors were less inclined to rate employee attraction and retention as a major issue. Just over 58 per cent see this as a problem, while the national average was notably higher at 74 per cent. Compared to our survey results from neighbouring Quebec – where the logging industry is relatively healthy with younger contractors and overall increasing profit margins – if trends continue in Atlantic Canada, the industry there is facing a major shakeup over the next decade or less.